Scooter is special needs sort of... but not really, as he is our fastest runner!, so loving, starved for attention, is very agile despite he is missing his rear leg. When he came to us, it appeared he had been a bait dog, his leg mangled, and had facial scars, he was young still under 2, we took him to doc and they amputated, he is totally rehabbed, mentally and physically and now is a very happy kinda guy. 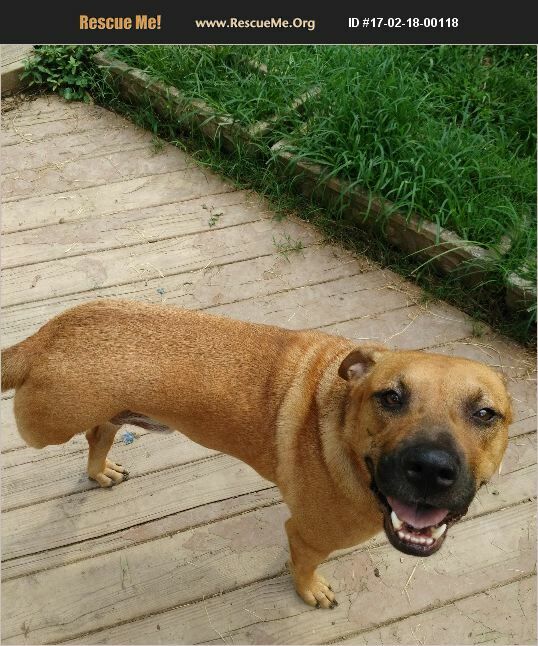 He is a bit pushy with other dogs because he likes to play too rough, so they typically don't care much for him unless they are his size or larger, then they play just fine. He does great with dogs of his size or larger and the very little guys....so dogs over 60 pounds or under 20 go great with a side of Scooter! He is a real sweetheart, highly intelligent, and loves to run and play outdoors, snuggle next to you on the sofa, and when he sleeps in the human bed, he lays still and keeps your feet warm. Sometimes he will chew his stuffed toys but usually after he has carried them around for days first. HE will not chew anything unless he gets bored. HE is always in a good mood and smiley. HE is about 50 pounds of pure joy and excitement. HE is so happy to be alive. He lives every moment to it's fullest. I would not consider taking him to a dog park though. If you have another dog I would suggest it be similar in size or bigger than him so that Scooters rough way he plays will not be an issue. WE don't know what mix he is...but guessing he has a lot of sugar in there. No medications, he is simply just an amputee. He really loves the girls, so a girlfriend to play with would be super good.